As light and lovely as the famous French wine it is named after, the Chablis is one of the rare apartments located just across the street from the Champs de Mars Gardens with magnificent views of the Eiffel Tower. You'll feel like you can reach out and touch the Eiffel Tower as it sparkles with thousands of twinkling lights during the magic night show! Enjoy shopping at the nearby Rue Cler market street and all the specialty stores surrounding the Chablis for a romantic dinner at home. 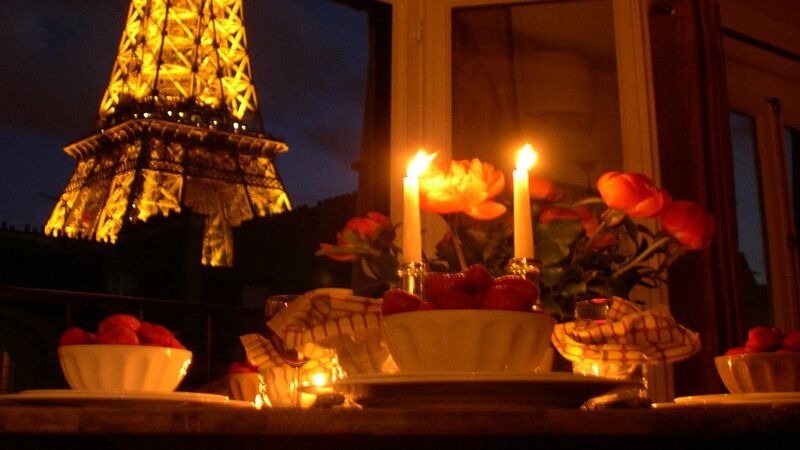 You'll have front row seats and marvelous views of the Eiffel Tower - absolutely unforgettable! Fully remodeled and filled with Parisian touches, this apartment for rent near the Eiffel Tower is ideal for a romantic getaway, close friends or a small family and ensures special vacation memories of Paris. There’s a modern air conditioner that covers the living room and bedroom for those few warm days in Paris. Please note that space in this apartment is limited and is a tight fit for 4 adults. It is more suitable for 3 adults or for 2 adults with 2 young children. You will fall in love with the dreamy setting in the 7th arrondissement very near the Seine and surrounded by a charming neighborhood with excellent cafes, restaurants and fun shopping. Enjoy picnics in the Champ de Mars gardens, go for romantic strolls along the Seine after dinner and walk to museums, Paris landmarks and so much more nearby! The Chablis is one of the rare apartments located just across the street from the Champs de Mars Gardens with magnificent views of the Eiffel Tower. You'll feel like you can reach out and touch the Eiffel Tower as it sparkles with thousands of twinkling lights during the magic night show! One powerful air conditioner: excellent mobile unit which cools the apartment beautifully. Like all mobile air conditioners in Europe, the hot air is vented thru the windows via a large tube. Located on the 6th floor (7th American) but the elevator only reaches the 5th floor; one flight of stairs is easy to take and definitely worth it! What can I say....my first visit to Paris was PERFECT! From the moment I began communicating about my trip with your company everything clicked into place. The rental process was seamless and extremely thorough. Nothing was left out or in question, all of my requests and questions were answered and I felt as if my trip was a priority. I was a little anxious with this being my first trip abroad, but I have to say that Paris Perfect covered everything in such detail that I was immediately at ease when we arrived. Our greeter, Kevin was wonderful and covered everything we could possibly need to know about our stay in the apartment. The apartment itself was literally perfect. We loved everything about it, the layout, the comfort level, the magical view of the Eiffel Tower and the location was absolutely amazing. We would jump up and watch the hourly sparkle show from the windows no matter what we might be doing. One could never tire of that view! My daughter and I felt so at home in the apartment and the neighborhood itself. We walked a lot and visited many areas in Paris during our stay and felt that the Chablis and its surrounding neighborhood to be the nicest of all. The stores, cafes, restaurants and business owners were all friendly and very welcoming. We truly appreciated that there was so much right there in our own little neighborhood, just a few steps away. Our trip to Paris was definitely an experience I will never forget and I am so happy that I chose the Chablis and Paris Perfect for my stay. I would give them the highest recommendation possible for their absolutely flawless attention to detail regarding our stay. Trust me, you will be spoiled by them and their hospitality. Thank you Paris Perfect! Thank you for posting your review! Other readers do so enjoy reading what has been said by someone who has stayed in the apartment. Lovely apartment with gorgeous views of the Eiffel Tower! Beautifully decorated, nice towels and linens and everything was set up perfectly for our arrival. I would recommend having the bedside lights not turn on all the lights in the apartment, only the ones by the bed to not awaken others. Otherwise really lovely and we hope to return, merci! Thank you for posting your review. Other readers always enjoy reading what has been said by someone who has stayed in the apartment. Perfect would be a very appropriate description for our experience this past month. The Chablis Apartment was exactly as described and being able to look out the window right at the Eiffel Tower was amazing. The apartment was perfectly placed for a for a great experience in Paris. We enjoyed that we were a short walk to Metro stops. The 7eme District has a great variety of very good places to stop by for a glass of wine or a meal. We ended up eating all of our dinners during our 5 night stay no more than a 10 minute walk from the apartment. Everything setup in advance for us was great. Our pickup at the airport, our Versailles Tour and Eiffel Tower tour were organized on point. Great tour guides! Our greeter could not have been friendlier which made our arrival easy after a long overnight flight. We will book again when our travels take us back to Paris! My husband and I stayed in the Chablis apartment at the end of September to celebrate our anniversary. It was our third time in Paris, but our first experience with Paris Perfect. We wanted to try something other than a hotel, and this place was a great solution. The communication with Paris Perfect before our trip was very good. They sent us all kinds of recommendations of places nearby the apartment (restaurants, boulangeries, markets, etc. ), and we referred to that list several times while in Paris. We were greeted by Kevin, who showed us everything we needed to know about the building and the apartment. The apartment was beautifully furnished, had lots of storage, a nice large bathroom, and was in the perfect location. The street was quiet and peaceful, and being situated just a 5 minute walk from the Eiffel Tower was a real high point for us. The best thing--by far--was having such a spectacular view of the tower. Especially at night! I know pretty much everyone has said the same thing, but the views of the tower twinkling at night is just incredible. We couldn't get enough of that! Honestly, the only downside of the apartment (at least for us), was that the bed wasn't the most comfortable. Nothing that would keep us from using Paris Perfect again, though. We hope to get back to Paris again soon! View of the Eiffel Tower is worth every penny!! This is our second stay in Paris using Paris Perfect. We choose the Chablis, a studio apartment. As we expected, a staff member greeted us at the apartment (albeit it was a very warm day in Paris and the apartment was not cooled down properly before our arrival!) Kevin showed us around the apartment and gave us the needed information for the apartment and building (i.e. A/C!, washer/dryer/dishwasher, trash, keys). This apartment was perfect for the two of us. Our highlight was being able to watch the twinkling of the Eiffel Tower each evening. Can't get any more romantic than that! Chablis is a compact apartment but there is room for everything. Once we settled in we loved going to the farmer's market Wednesday morning on Avenue du President Wilson (one of the best markets we have been to!). Also loved going to Rue Saint Dominique to pick up our wine, roasted chicken, meat, croissants. Ready to live like a Parisian!! Don't miss walking to Picard on Rue de Grenelle for some of the best frozen (yikes) food - locals shop there so you know it is good - and after a long day of enjoying Paris it was an easy dinner to come home to. Writing this review makes me want to return immediately!! Thank you Paris Perfect for making it easy to choose an apartment rather than a stuffy hotel room!! Thank you for posting your review. Reading what someone who has stayed in the apartment is so helpful to others. Second stay in the Chablis. Perfect location, perfect apartment for 2. Extremely well thought out storage solutions & can't beat the view from the windows. Would definitely recommend this apartment to anyone coming to Paris! Thanks for posting! So helpful to others to read what you have to say!